Fastening tools include clamps, powder actuated tools, rivet guns, and other specialized hand tools. In addition to those, we provide clamp reviews that cover all types of clamps for the Pro carpenter or remodeler. Fastening tools and clamp reviews take us into a broad category, but they’re important to nearly all trades. 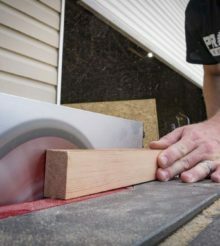 Whether fastening a piece of material down using a set of DeWalt trigger clamps or using a Kreg Automaxx bar clamp to glue boards, fastening tools and clamps are key. The thing about fastening and trades is that each one has its share of tools in the category. With woodworking, we review lots of clamps and even some glue guns. For decking and framing, a Rockwell Jawhorse may be a key component to securing pieces about to the fastened with other tools. On a roofing project, a tool like the Bostitch anti-vibe hammer tacker may be used for securing tar paper. Finally, in decking, you can find products like the CAMO Marksman Pro X1 hidden deck fastening system.